For further information on Salar Shadizadi case please click here. 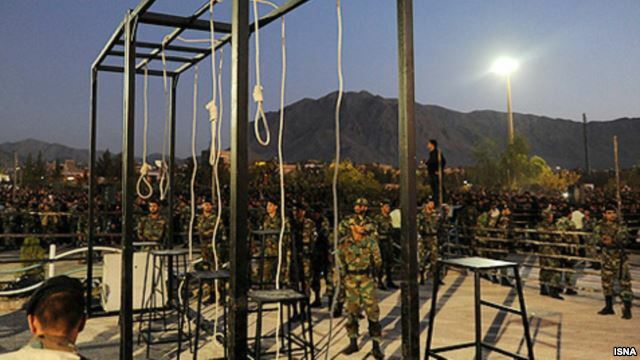 The Killing Machine of the Islamic Regime in Iran doesn't want to stop , instead of keeping the criminals in prison and trying to use rehab programs ,it send them to the gallows group by group , this is the major violation of human rights . 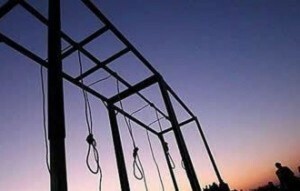 Report today by HRANA indicates that; five prisoners were sent to death gallows today in Shahab prison in the city of Kerman and three others were sent to solitary confinement for execution in Bandar Abbas city. Among the executed one was women and the rest were men and they had drug trafficking charges. 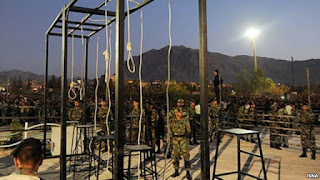 The officials of the judiciary keep most of the execution secret to the last hours , violating the rights of prisoners. According to a report , in Iran from 2005-2014 at least 72 juveniles ( at the time of crime ) were executed and 160 other juvenile who have committed criminal act are sentenced to death and are awaiting their execution. 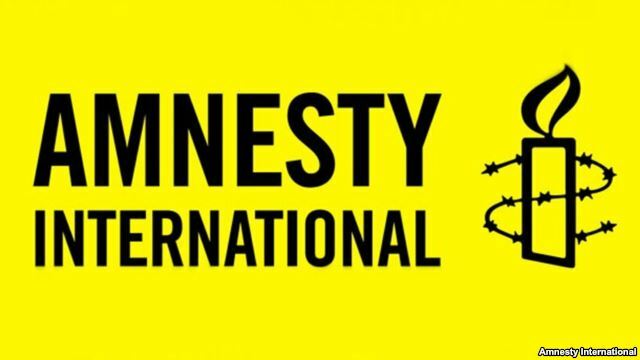 According to a report by Amnesty International , Iran has signed the International convention on citizen and political rights and based on Islamic Republics signature under this agreement , they must not execute people who are under the age of 18 ( juveniles ). 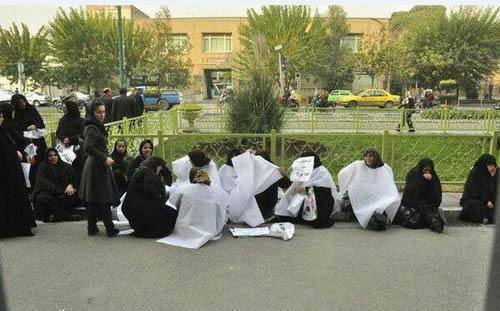 Why is it so hard for the regime to understand that, they can give chance to these prisoners and keep them in prison and use different rehab program to make them new person .........? ???? Published on Wednesday 22 April 2015. 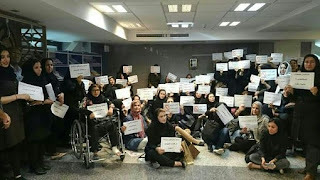 Reporters Without Borders is appalled by the way rival government factions in Iran are using the case of detained Washington Post correspondent Jason Rezaian for political purposes in an unrelenting struggle for power. Rezaian, who completes his ninth month in detention today, is to face trial on several charges including spying, his lawyer reported two days ago. He has US and Iranian dual nationality. 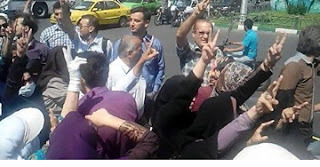 Arrested in a completely illegal manner by Revolutionary Guards on 22 July 2014, Rezaian has been held ever since in the security wing of Tehran’s Evin prison. Like other detained journalists, he has been subjected to to a greal of a pressure, including long spells of solitary confinement, in order to extract a confession for use in a trial. His lawyer, Leila Ahsan, told Agence France-Presse on 20 April that he is accused of spying, cooperating with hostile governments, gathering confidential information and anti-government propaganda. She added that her meeting with Rezaian on 20 April was their first since she took the case at the start of March. Responding to the report the same day, Washington Post editor Martin Baron described the allegation as absurd and condemned the fact that Rezaian had been denied any legal advice for the past nine months. Vatan-é Emrooz, an extremist daily that supports the Revolutionary Guards and former President Mahmoud Ahmadinejad, ran a front-page story on 18 April that was headlined “Unveiling Jason’s secrets.” It accused Rezaian of infiltrating the government and various institutions to uncover the methods used by Iran to circumvent international sactions. “Iranian opponents of the nuclear accord with the United States and better relations with the international community have been referring to the Rezaian case since 3 April, and this is no coincidence because Rezaian was arrested with the aim of being used in this all-out war betweeen rival ruling factions,” said Reza Moini, the head of the Reporters Without Borders Iran/Afghanistan desk. 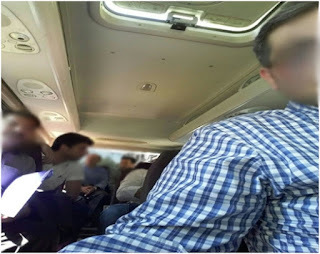 Revolutionary Guards in plain clothes arrested Rezaian at his Tehran home on 22 July along with his wife, Yeganeh Salehi – a journalist working for The National, a newspaper based in the United Arab Emirates – and two other US citizens. Their apartment was searched and ransacked, and all computers and electronic devices were seized. The two other US citizens were released provisionally a month later. After payment of a large sum in bail, Salehi was freed provisionally on 4 October pending trial. Ever since his arrest, Rezaian’s family in the United States has been pressing the Obama administration to make his release a priority. More than 400,000 people have so far signed a petition for Rezaian’s release that Reporters Without Borders has relayed. Reporters Without Borders secretary-general Christophe Deloire joined a dozen well-known media figures, including Noam Chomsky, Anderson Cooper, Christiane Amanpour, Marty Baron and National Press Club president John Hughes, in writing to Iranian judicial system chief Sadegh Amoli Larijani requesting Rezaian’s immediate release. Rezaian is not the only information provider with dual citizenship currently held in Iran. 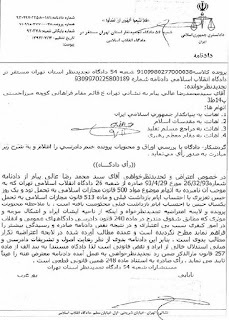 A Tehran court sentenced Roya Saberi Negad Nobakht, who has dual Iranian and British citizenship, on 27 May 2014 to 20 years in prison, a sentence that was reduced to five years at the start of this month. Farideh Shahgholi, who has dual Iranian and German citizenship, is serving a three-year jail term. Both were arrested in connection with their activities on Facebook and other social networks. President Obama half-heartedly requested Rezaian’s release in his Iranian New Year greeting on 20 March. The British and German authorities have not so far issued any official statement about the detention of their citizens. It is time the international community seriously tackled the Iranian authorities about respect for fundamental rights and the release of detained journalists and online activists. the 2015 Reporters Without Borders press freedom index. According to Tabnak news online, 150 Iranian women medical students protested against the regime's program for women medical students in front of Ministry of Health. These program discriminate between men and women medical student about their medical serving time prior to become a doctor. According to this program men must spend two years internship while the women must finish 8 years medical practice. 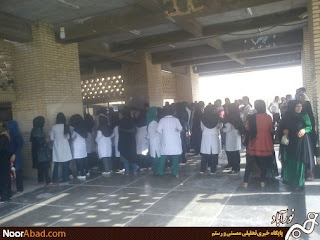 Yesterday morning Ms. Razmjouei a female doctor in Valey - Asr Hospital in the city of Mamasani of the Fars Province was physically assaulted by the city judge ( the judge slapped doctors face) who have visited the hospital for a wounded patient ( woman assaulted by husband and commit suicide), due to argument, the judge slapped the female doctor and then handcuffed her and later detained her....due to this incident and illegal arrest the hospital staff ; doctors and nurses of the hospital walked out of the job in protest to this judges action and demanded for her release and the removal of the judge from the city bench and a written apology by the judge. 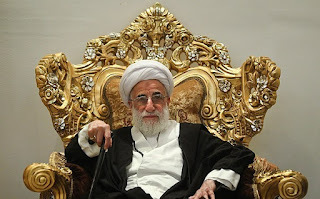 also Friday Prayer Imam of Tehran and is known as the hard line fundamentalist Islamist and in the past was strong supporter of Ahmadinejad's Government ,for repression and against green movement and its leaders. Ahmad Janati said: The Iranian Society situation is " very bad " and at present " disorder , lawlessness, and bribery " has reached to its highest level in Ministry of Justice and Governmental agencies. He also said ; usury has also reached to its highest in the country . However , from early morning the plain clothes security agents and anti riot police forces prevented the protesters to get together and forced them to disperse , they even asked the shop keepers to go inside their store and have arrested more than hundreds of Iranian teachers ( in one report 200 teachers were arrested) and carried them by van to an unknown location.
" More than 100 teachers joined the rally from the city of Isfahan but 30 of them were arrested. I am arrested with twelve other colleagues from the city of ; Mashhad , Ghazvin , Shahr Kord , Kurdistan and .....we are all in a Van and we do not know where the security forces are taking us ...... "
The Security Forces of The Islamic Regime In Iran Have Arrested Several Iranian People From the City of Ahwaz ! 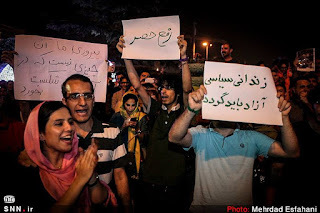 According to a report by Karim Dahimi a human rights activist, Several Iranian People From the city of Ahwaz have been arrested by regime security forces during the month of Ramadan . 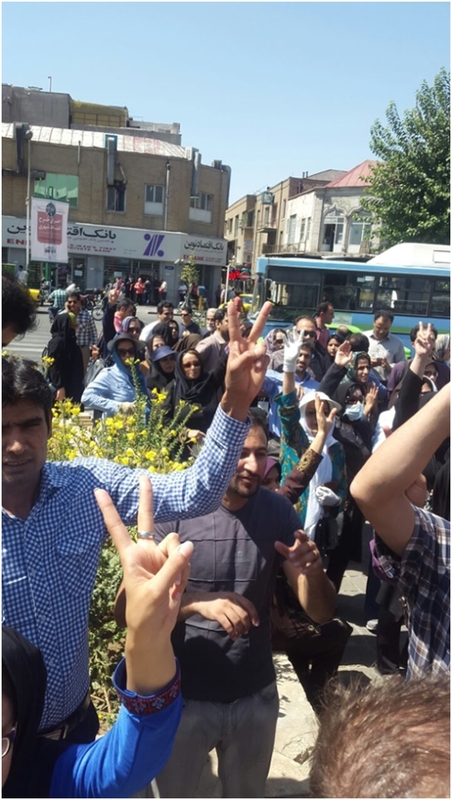 All these people were arrested during the month of Ramadan by security forces and most of these Iranian people are from Different district in Ahwaz city and Khoramshahr . These people are Sunni Moslem and are charged for Religious Activities , the report said. GENEVA (15 July 2015) – United Nations Special Rapporteur Ahmed Shaheed today called on the Government of the Islamic Republic of Iran and the international community to seize the opportunity created by the agreement on Iran’s nuclear programme to address the human rights situation in the country. 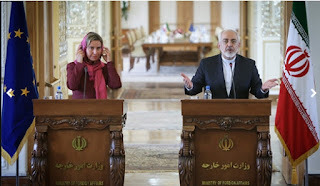 Mr. Shaheed congratulated all parties to the negotiation for reaching an agreement on Iran’s nuclear programme, and noted that the lifting of economic sanctions will have a beneficial multiplier effect on the human rights situation in the country, especially on the enjoyment of economic, social and cultural rights. “Peace, development and human rights are deeply interlinked,” he stressed. Since 2012, the expert has been warning about the apparent ineffectiveness of humanitarian safeguards against the impact of economic sanctions on the country’s human rights situation in his reports* to the UN General Assembly and the Human Rights Council. The reports outline Iran’ s increasing economic hardships and point to staggering inflation, among other issues, as cause for serious concern about protections for the rights to food and health in the country. “It is my sincere hope that the successful conclusion of the nuclear talks, which will enable the lifting of economic sanctions, will allow President Hassan Rouhani to focus on his other campaign pledges, specifically those to promote the enjoyment of all human rights by the Iranian people,” Mr. Shaheed said. The Special Rapporteur urged the Government of Iran to spare no effort in addressing long-standing human rights concerns repeatedly raised by the UN human rights mechanisms, especially the alarming surge in executions this past year, increasing restrictions on freedom of expression and peaceful assemblies, women’s rights, discrimination against religious and ethnic minorities, and the ongoing prosecution of journalists, lawyers and human rights defenders. Mr. Shaheed renewed his call on the Iranian authorities to engage constructively and meaningfully with his mandate by allowing a visit to the country, and reiterated his desire to work with the Iranian officials to address human rights challenges in Iran. GENEVA (14 July 2015) – The new United Nations Special Rapporteur on human rights and international sanctions, Idriss Jazairy, welcomed the nuclear agreement reached between the Islamic Republic of Iran and the group of P5+1 (China, France, Russia, the United Kingdom, the United States and Germany) announced today, and called for the various sanctions and unilateral coercive measures in force against Iran to be promptly lifted. 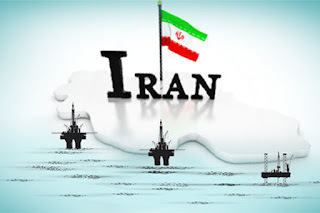 “In addition to international sanctions authorized by UN Security Council resolutions, Iran has been subjected for years to a range of additional, unilateral coercive measures decided by a number of States individually or in the framework of various regional organizations,” Mr. Jazairy said. “The stockpiling of sanctions and unilateral coercive measures against Iran, some of which went well beyond what was required by the Security Council, has had a significant adverse effect on the country’s economy, its population and ultimately on the enjoyment of human rights of the people of Iran, including its right to food, its right to health and its right to development,” the expert noted. The Special Rapporteur drew special attention to the “indiscriminate character” of measures such as the ban on the use of international interbank financial telecommunications, or of measures having the effect in practice of impeding access to medicine and medical treatment. 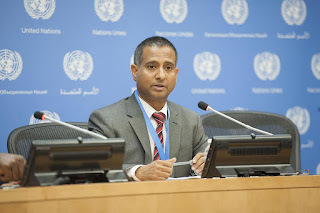 The independent expert urged all countries which have imposed coercive measures on Iran to lift them promptly and with immediate effect, in line with the commitment contained in the agreement to comprehensively lift UN Security Council, multilateral and national nuclear-related sanctions, including steps on access in areas of trade, technology, finance, and energy. The UN Human Rights Council established the new Special Rapporteur’s mandate in September 2014, in response to increasing concern by the UN human rights system and the international community about the negative impact of sanctions, including unilateral coercive measures, on the enjoyment of human rights, particularly their negative impact on the human rights of the civilian population of targeted. In light of the expected nuclear deal between the P5+1 and Iran, FIDH remains deeply troubled that the negotiations have failed to include any mention of human rights. 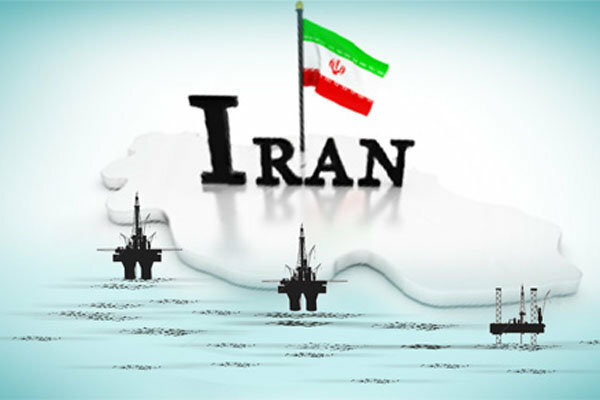 This is despite numerous demands over the past year by the EU, FIDH and previous UN High Commissioner for Human Rights, Navi Pillay, among others, who have called on the international community to include human rights issues in all of its dealings with Iran. 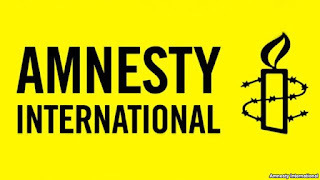 Of particular concern is the ongoing harassment, targeting, and arbitrary arrest of human rights defenders in Iran, including three FIDH members: Abdolfattah Soltani, Mohammad Seifzadeh, and Nargess Mohammadi. To learn more about the experience of human rights defenders in Iran today, and how they have persevered, visit our #ForFreedom campaign website or read our recent profile of the Iranian human right lawyer Nasrin Sotoudeh. 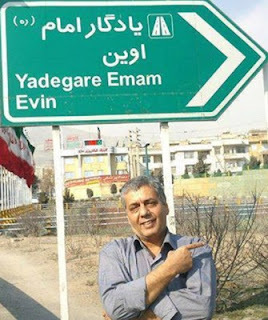 On April 22 this year ,Mohammad Reza Ali Payam the Iranian poet, Satirist and film maker attended at Evin prison to spend the 15 months prison sentences. After spending a few day in ward eight of Evin he was transferred to Gohardasht prison in Rejaei Shahr . Together with other political prisoners in Gohardasht prison and in protest against the prison officials decision to keep them with dangerous criminals prisoners ,they went on hunger strike since 10 days ago ,but because of deteriorating health condition of Ali Payam ,the have ended their hunger strike. Mehr Newspaper published an article asking people of Iran, if the problem of Iran is; Managerial or Sanction????!!!! 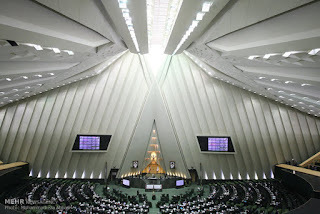 According to Mehr News Agency 16 members of parliament collectively gave their resignation to the parliamentary speaker because of an appointment by minister of interior . Minister of interior have appointed a governor for this province which is against the will of these MPs and 5000,000 people of Fars province they represent. These MPs left the parliamentary session this morning . According to news, the MPs believe; the governor nominated by the Ministry of Interior know nothing about the province. Hosein Ronaghi Maleki's Mother : If you Take Hosein's Father To Prison , I won't become Silent ! Hosein's Mother: We Have Voted For Freedom and Not For Your Lies ! 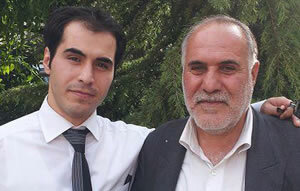 Hosein Ronaghi's Father is sentenced to four months in prison because he broke his silence and spoke with media about his son's case , he was told by security forces to keep quiet and not to speak to media. Hosein's mother Ms. Zoleykha Musavi said: Based on article 134 of the Islamic penal code , Hosein was released and his re-arrest and detention was illegal and if they will bring Hosein's dad to prison because he did not keep quiete as told by security forces , i would not keep silence and no one can make me quiet. How can we keep silence, when they have taken our son to prison ,he was healthy , they have made him sick, he has lost his kidneys, they have violated his legal rights , and they they keep on saying to us to be quiet , don't give interviews , don't speak, how can we do that? How can we keep silence? They have given four months imprisonment to Hosein's father because he said, help my son, because my son is going to die. Time and time the security forces have told me don't make interviews , and i told them; release my son and i wont talk or interview. Now they will come and take Hosein's father to prison , their problems is going to be solved and thing will become quiet?If he goes to jail , i wont keep silence....They think they can make me quiet ... They have taken my child to jail , made him sick and won't allow any medical treatment for him and then they ask me not to make interviews , if it is bad ,then you shouldn't do that . Don't do the bad and we won't make interviews to let the whole world know about the case. Esmail Abdi, a leader of the Iranian Teachers' Trade Association, was arrested June 27 following his attempt to obtain a visa to attend the 7th Education International World Congress in Ottawa, Canada July 21-26. 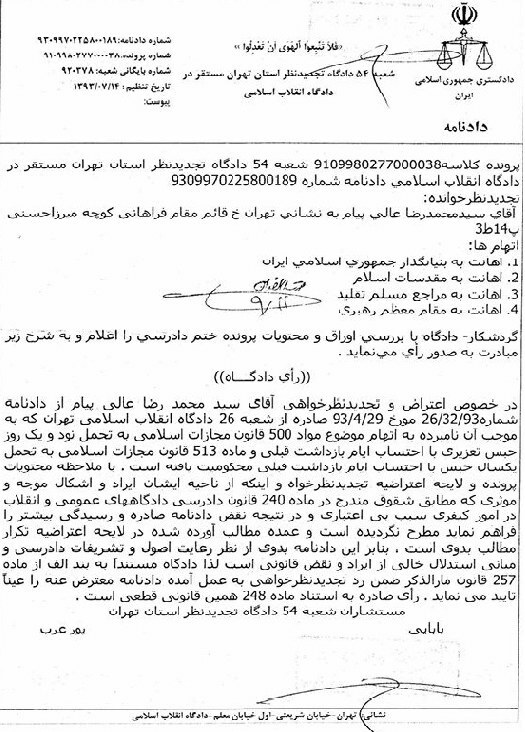 After his passport was confiscated at the border, he was ordered to return to Tehran to meet with prosecutors. However, upon reporting to the prosecutors' office, he was arrested while more than 70 teachers waited outside in support. Abdi's arrest comes after nationwide rallies were held earlier this year to protest wages that leave the majority of teachers below the poverty line. Education International is deeply concerned about the repression facing representatives of the Coordinating Council of Iranian Teachers Trade Associations. Esmail Abdi, un des responsables de l'Association professionnelle des enseignants iraniens, a été arrêté le 27 juin, suite à sa tentative d'obtenir un visa pour participer à la 7ème Congrès de l’Internationale de l’Éducation à Ottawa, au Canada, du 21 au 26 juillet. Après la confiscation de son passeport à la frontière, il lui a été ordonné de retourner à Téhéran pour rencontrer des procureurs. Il a été arrêté dès sa présentation au bureau des procureurs où 70 enseignantes et enseignants manifestaient leur solidarité à l'extérieur. L'arrestation d’Abdi fait suite à des rassemblements dans tout le pays au premier semestre pour protester contre les salaires qui, pour la majorité des enseignantes et des enseignants, sont inférieurs au seuil de pauvreté. L'Internationale de l'Education est fortement préoccupée par la répression des représentants du Conseil de coordination des associations d'enseignants iraniens. We are teacher unions, federations and associations who represent half a million teachers, education professionals and education workers in Canada. Nous sommes des syndicats, des fédérations et des associations qui représentent un demi-million de membres du personnel enseignant, professionnel et de soutien du Canada. Canadian Teacher Federation in a letter to Ayatollah Khamenei and to president Rohani demanded for immediate release of Iranian imprisoned teacher Esmai Abdi. I'm writing this letter on behalf of the voice of 200,000 Canadian Teacher federation and 30,000,000 members connected to Education International ( EI) about the immediate release of our colleague and imprisoned teacher Esmail Abdi and furthermore as a host organization to EI we demand you to facilitate for his travel to Canada to attend the EI meeting from July 21-26 ,2015. 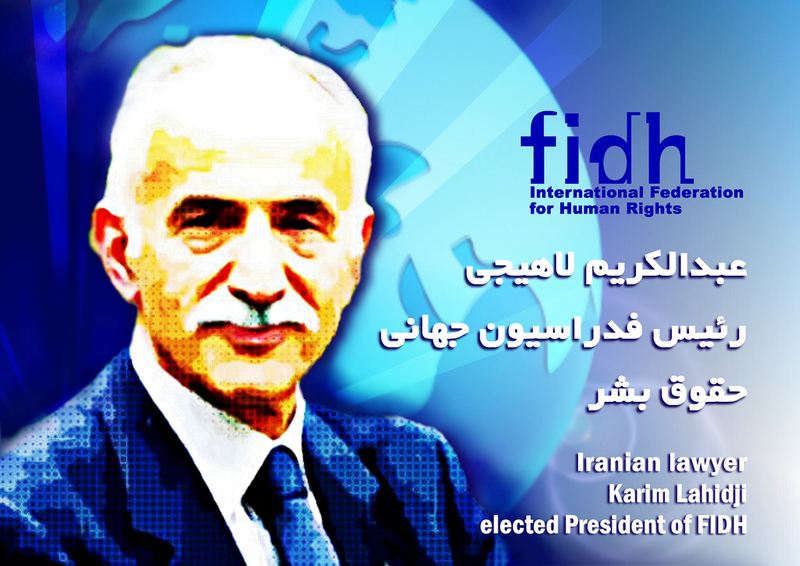 Iran as signatories to the International human rights charter must uphold its obligation to its international conventions . Confiscation of Mr. Esmail Abdi's passport , arrest and prevention for his travel to Canada to attend the EI congress is the violation of human rights and human rights resolutions. We expect you will immediately release him and facilitate his travel to Canada , Time is short . He is charged with not keeping silence after being told by security forces to keep silence and not to talk to the media about son's case ....the legal term in Islamic republic for this act is " publication of lies via interviews and letter writings about son's case.."
According to HRANA on Sunday the sentencing by branch number eleven of the court of revolution was delivered to him. 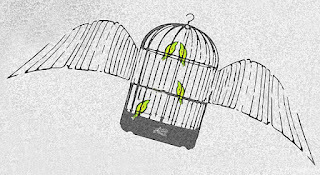 Hosein Ronaghi a blogger and human rights activist was sentenced to 15 years imprisonment after election coup in 2009 . In the past he spent months in " Ward two -Alef " and ward number 350 in Evin prison and he was released because one of his kidney failure and was under treatment . Under Islamic Republic's Judiciary family's are being harassed or imprisoned if they speak to media about their children's case. In recent month a Kurdish-Iranian women by the name of Farinaz Khosravani 28 years old who was employed by Tara Hotel in Mahabad city was killed at Hotel by falling, people including family members believed that, she was killed because she didn't want to be sexually assaulted by members of regime. 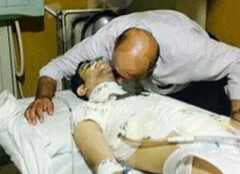 People of Mahabad after the incident gathered in front of the hotel and protested and then burned the hotel, but police forces together with paramilitary and Sepah forces used tear gas and later shot the people and as a result one young Kurdish man by the name of Akam Talaj was wounded by gun shot wound and was transferred to hospital ,but after 53 days he died to this wound. The security forces told to his family keep silent during funeral and after the funeral ,not to talk with any people or media.